OK, OK; I know tomorrow is Thanksgiving. But I’ve been itching for Christmas since the Halloween accoutrements hit stores, and for once I’ve had no problem with Chrimbo being rolled out ridiculously early by the gods on Mount Retail. (But please, keep the effing holiday music away from me. Yech. This will forever be a playlist-free blog.) I’m dying to get the tree and ornaments put up, and I’ve actually already started covering our living room ceiling with snowflakes. Last Christmas was a bit of a non-starter, so I’m ready to put my Grinchy ways aside and spread some cheer, dammit. What does this mean for you? Well, I’m planning to share all my crafty Christmas stuff (“crap” would’ve alliterated better, but I shan’t give you crap!) with you here—photos, tutorials, patterns, and other bits of fun. 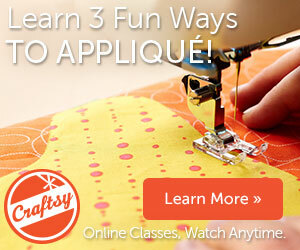 So to start with, a free pattern for appliqué (or embroidery, if you like)! 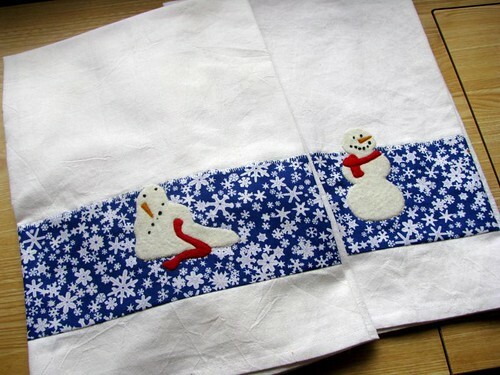 I made these tea towels for Middle Brother and his wife a couple years ago, fusing wool felt to the background to give the snowmen some dimension. A really narrow zigzag around the edge of the felt with matching or invisible thread rounds the edges rather splendidly. Why is Snowman C so ill-spirited? You’ll have to supply your own motivation; I’m just supplying the pattern. Get the PDF to print out and transfer for your favorite appliqué or embroidery technique. Get the EQ7 project file to use the snowmen blocks (on the Motifs tab) in your own quilts or other EQ designs. Designs are copyright © 2010 Feed Dog Designs, but you’re free to use them on Christmas gifts, decor, or whatever you like. Happy stitching, happy Thanksgiving, and look for more holiday goodies here soon! Thanks for such a neat pattern!!!! Thank you. These are so cute. My girlfriend is having a Year of the Snowman (2010). I have already given her a cross stitch chart similar to this but instead of melting snowman A, Snowman C knocked his head off with a snowball. She though that was funny so she will adore this. Thank you again. These are brilliant! Thanks so much for sharing. What a great gift for the awkward males in your life, who wouldn't want a snowman crime scene tea towel?? Karen 'n Chris, I love idea of the head-injury snowball cross-stitch.